Two hot items for you to munch on, swallow, and then belch out. First off: a reminder that the First Annual Cascadia Cup* is happening on November 7. Registration is now completely full. Thank you for those that have signed up. It’s gonna be fun! If you didn’t know, Cascadia is the bio-region commonly known as the Pacific Northwest. It’s a lush enviro, all green-like and pretty, super casual and phased, and some people here want the United States to just get the hell out of it forever. You need to sign up ahead of time for this tournament. We are making t-shirts and stuff, and the prize packages will be SWEET. Pre-registration ends TOMORROW, Oct. 1. So sign the eff up. We currently have 29 registrants, and we’re gunning for 36 so that we have a nice clean bracket. AKA space is limited! More information can be found on the Cascadia Cup page. Item number dos: Casual flow knows no bounds! Much to everyone’s happiness, local operator Ricochet Pinball has taken over the C-Bar. They’ve added seven machines to the place. And in celebration, they set up an amazing bounty hunt on the machines there (well, on five of them). The bounties are thus: Whomever holds the GC on a machine on the deadline of Oct. 15 wins $100! Uh yeah… that’s huge, people. That’s $500 in total prizes. There’s already some tight competition on them. But some of the machines are still just waiting to be slayed. So have at those machines! Discuss the bounties here. Thanks, Ricochet! *it’s sort of the 2nd annual… I dunno. whatever! at the Satellite lounge in Williamsburg (143 Havemeyer St between S 1st& 2nd). Single elimination / or 16 groups of 4 players ( 7 fixed rounds with first 2 advance ). 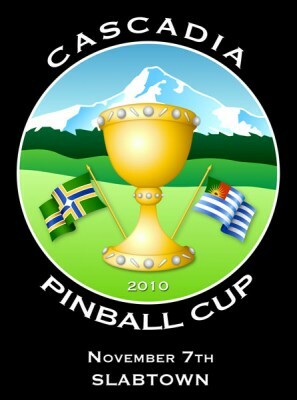 Results will be submitted to World Pinball Player Ranking Points. You can also sign up the day of tournament. Come and play! Everyone over 21 welcome!